Mourning Becomes Electra is a re-casting of a trilogy of Greek plays; the ‘Oresteia’ by Aeschylus, the only extant trilogy of Greek tragic drama. Lifting the scene from ancient Greece to post-Civil War New England, Eugene O’Neill (writing in the 1930s) contrives a series of plays that is violent, sexual and psychologically interested. The first thing I noticed, is that the writer gives a theatrical nod-of-the-head to his sources by bestowing his characters with names which phonically resemble their ancient counterparts; thus Agamemnon becomes ‘Ezra Mannon’, Clytaemnestra ‘Christine’ and Orestes is re-cast as ‘Orin’. “Go and see it performed!” is a sentiment I’d usually yell in the face of somebody pouring over the text of a play – Yes I would not recommend reading a play over watching it in performance, and Yes, I’m going to contradict myself here…. 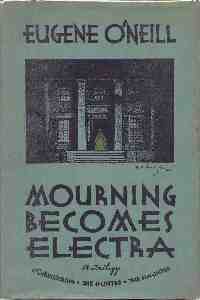 The fact of the matter is that reading Mourning Becomes Electra is a unique experience in and of itself. This is entirely due to O’Neill’s copious and profuse stage directions, which are so precise and exhaustive that they create an almost novelistic reading experience. It is immediately clear why O’Neill had a reputation as a difficult writer to work with; many of his stage directions are impossible to realise in performance, due to the limitations of the theatrical medium. Most of them read more like psychological asides and comments to a reader than actual instructions to a performer. This problem means that reading these plays is as important a part of realising their aesthetic identity as watching them performed. It may sound twee in abstraction, but in the dark and bitter context of the drama, this type of expression is never over the top or unnecessary. This is a series of plays that must be read as well as seen. Moving, passionate and with a final sequence that proves O’Neill not only has the courage of his literary convictions, but is unafraid to tamper with source material which is often considered ‘sacred’. But any Greek literature fanboys (if such people exist) shouldn’t be put off by this; Mourning Becomes Electra is truly Grecian in spirit – a bloody, violent romp on stage, in which one pool of blood is only ever washed away by another. 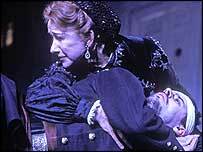 This entry was posted in Plays, Reviews and tagged Eugene O'Neill, Greek Tragedy, Mourning Becomes Electra. Bookmark the permalink.